Are you aware the U.S. is experiencing a skin cancer epidemic? The Skin Cancer Foundation points out that treatment for nonmelanoma skin cancer (squamous and basal cell carcinoma) increased by 77% between the years 1992 and 2006. Ninety percent of these nonmelanoma cancers are due to sun exposure, which means more people than ever before are developing nonmelanoma skin cancer on body parts that tend to be most exposed to the sun: the face, neck, hands, and feet. Scarring and skin tissue removal are huge concerns to patients who are facing cancer surgery on these areas. Fortunately, Mohs surgery – or simply “Mohs” – offers an alternative to traditional surgery. I’m a Mohs surgeon and member of the American College of Mohs Surgery, and I want to introduce you to Mohs, a unique type of cancer surgery. Not only does Mohs have the highest cure rate for both new and recurring tumors, but it also leaves significantly less scarring compared to traditional cancer surgeries. In my opinion, Mohs is one of the most exciting and promising advancements in skin cancer surgery. To help you understand Mohs, I’m creating a series of posts that cover this forward-looking health topic. These include 1) a basic introduction to Mohs surgery and explanation of its advantages; 2) what a Mohs patient can expect before, during, and after the procedure; 3) the history of Mohs and what it is today; and finally 4) how to find a reputable Mohs surgeon. I’ve performed thousands of Mohs surgeries and have found that there are four distinct advantages to Mohs over traditional cancer surgery. In this post I will introduce you to Mohs by explaining these differences along with the advantages of Mohs. The Mohs surgeon acts as pathologist. a Mohs surgeon acts as both the surgeon and the pathologist. In other words, the same person cuts the cancerous tissue and analyzes it to make sure all the cancer has been removed. This activity happens in real time while the patient is waiting. When the Mohs surgeon analyzes the tissue and notices there is more growth at a specific point, he or she knows exactly where to go for more removal. In traditional surgery, on the other hand, a second person – the pathologist – would analyze the tissue and then explain to the surgeon where the surgeon needed to go to find and remove the remaining cancerous tissue. Because the same person is both the surgeon and the pathologist in Mohs, the risk of communication error is eliminated. Anytime there is a communication point between two health care providers, there is risk for error. Mohs surgery eliminates this risk at a very sensitive point: tissue removal and analysis. With Mohs, the ability to completely remove this potential communication error, even if it’s small, is extremely beneficial to the patient and provides a more coordinated care experience. Second, Mohs allows the surgeon to be more precise in tissue removal. I have found this to be a huge advantage over traditional surgery. 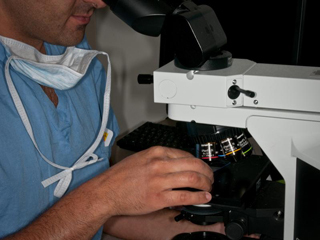 Mohs surgery removes only the cancerous tissue and not one bit extra, even at the microscopic level. This includes tissue that is visibly affected with cancer as well as the cancer’s microscopic spread. Microscopic spread describes spreading cancer cells that are not visible to the naked eye. In traditional cancer surgery, the surgeon takes the tissue that he or she can see with the naked eye plus additional tissue in the margin. I want to explain the term margin because it’s an important concept to all cancer surgeries. Margin is simply a number that refers to how much additional tissue surrounding a tumor should be removed. Surgeons want to remove enough tissue to ensure a 90-95% cure rate. The margin varies depending on the type of tumor and its expected microscopic spread. If the tumor is a solid ball you don’t need much margin. However, if it’s a different type of tumor, e.g., one with large fingerlike projections that go in every direction, you may need up to a 5 cm margin. That’s a significant amount of skin tissue! All surgeons look at the injury rate and amount of potential suffering verses taking too much tissue or not enough. For many of my patients, skin cancer tissue removal is a very big deal. The face is a cosmetically sensitive area while the feet and hands don’t have a lot of tissue to spare. You can see how the margin size begins to quickly appear very large in areas such as lips, eyes, nose, ears, and hands. This is why I think Mohs surgery is so great! It takes tissue sparingly and directly. I only take what is needed without any extra marginal tissue. In traditional cancer surgery, you can’t achieve the same level of tissue removal precision that you can get with Mohs. This advantage may seem too good to be true and leads to another question many people have. If I am taking less tissue than with traditional surgery, what’s the cure rate of Mohs surgery? The answer is the third difference between Mohs and traditional surgery. Third, the surgically removed skin tissue is processed differently in Mohs. As a result, there is a much higher cure rate with Mohs than with traditional cancer surgery. Bottom line: a Mohs surgery patient enjoys a much higher cure rate with a much more cosmetically acceptable hole in the tissue. Here are some numbers. The Mohs cure rate for primary basal or squamous cell carcinoma is 97-99% compared to 89-95% with any other method. With a recurrent tumor, the Mohs cure rate is estimated at 95% versus 60-70% using other methods. The research indicates that Mohs patients enjoy a higher success rate because Mohs surgery, when conducted by a capable, well-trained Mohs surgeon, is able to determine the extent of spread of all the cancerous tissue. Fourth, studies have shown Mohs surgery to be just as cost effective as other methods, if not more so, for tumors that are good candidates. This is in part because Mohs is done under local anesthesia in an outpatient setting, and the Mohs surgeon functions as the operating surgeon, pathologist, and reconstructive surgeon; there are not separate fees for the operating room, anesthesia, pathologist, or other consulting physicians. Patients usually leave the office fully repaired, with the highest cure rate and the least amount of disruption to their daily life. The cost benefit is extended if you factor in the safety of local anesthesia over general anesthesia. The risk of developing a nonmelanoma skin cancer increases with age. 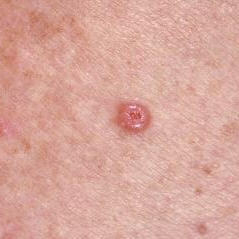 In the U.S. 40-50% of Americans who live to age 65 will have basal or squamous cell carcinoma at least once. Local anesthesia is a much safer option for older patients, especially for those with other medical conditions who can’t tolerate other types of anesthesia. In addition to the low up-front cost, because Mohs has a higher cure rate, the amount of money spent on tumor recurrence is less. If you factor in the cost of reoccurring cancers, patient discomfort, and risk of complications, the cost of traditional surgery quickly outpaces Mohs. Mohs is an excellent option for nonmelanoma cancers, such as basal and squamous cell carcinoma, that are large or recurrent. It’s also good for tumors in scar tissue and for tumors found in any area where tissue sparing is important, such as portions of the hands, feet, face, neck and genitalia. Mohs is also an important tool for any tumor where it is difficult to determine the extent of the lesion. There are some instances where Mohs is not a good option. For example, Mohs isn’t a good treatment for tumors with skip areas. In some cancers, a tumor will “skip over” some tissue and grow elsewhere. With these specific types of tumors, Mohs analysis will indicate a clear margin even if there is another tumor beside it. It is also not used for small primary tumors in parts of the body where a normal margin can be taken without adversely affecting outcome. Between the nonmelanoma cancer epidemic and the recent advancements in Mohs, I’m finding that Mohs is becoming more available and accepted. However, because Mohs surgery is dealing with cancer on cosmetically sensitive areas, you need a qualified surgeon who is trained in all aspects of Mohs: surgery, pathology, oncology, and reconstructive surgery. For my next post in this Mohs Learning Series, I’ll walk you through a Mohs surgery and what a patient can expect during a procedure as well as what happens behind the scenes.